MMTS means Multi-Modal Transport System and local system in Hyderabad. It functions with the collaboration of Andhra Pradesh Government and South Central Railway (SCR). This train service commenced on 9th August, 2003. S.Satyavati is the first woman loco pilot to drive MMTS train 'Matrubhumi Ladies Special Train' from Falaknuma to Lingampally station. MMTS train service covers a total of about 43 kms. in Hyderabad and Secunderabad. There is provision of issuing computerised MMTS tickets. ATVM machines and Reservation Counters have made it easy to obtain MMTS and general tickets. ATVM machines are available in MMTS stations. The MMTS train timings can be gauged from display boards at all MMTS stations. MMTS rail system has helped people to commute easily as there is separate ladies compartment along with First Class and General Compartments. If you obtain the combined pass (for APSRTC buses and MMTS), you will be able to travel by train and bus on a single pass! For people working in Hyderabad or nearby places such as Secunderabad, Nampally, Lingampally and Falaknuma, this service is like a welcome boon in disguise! IT Companies even run shuttle services for their employees. South central railway recently introduced ATVMs for automatic ticketing in mmts stations. People can make use of this facility at all the stations in Hyderabad city. The ten MMTS stations where you can avail the facility of ATVMs are Fatehnagar, Hafeezpet, Sanjeevaiah Park, James Street, Borabanda, Khairatabad, Jamai Osmania, Yakutpura, Dabirpura,and Huppuguda. MMTS travellers can purchase General Second class tickets to any station from the ATVMs which have a user friendly touch screen and operate round the clock. You can get an ATVM Smart Card on payment of Rs.80/- which includes a refundable deposit of Rs.30/-. First Class Fare is much higher than General Fare for journey to any station. Knowing MMTS train timings can save you lot of time and inconvenience. Travelling has become much easier not only for daily commuters but also for tourists in Hyderabad - thanks to MMTS trains. These trains help people to commute within Hyderabad as also to sub-urban locations near the twin cities of Hyderabad and Secunderabad. 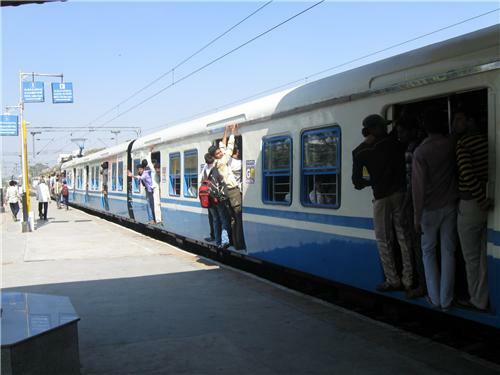 Travelling can become cheaper if one obtains a pass for travelling in trains and buses.MMTS train services are also available in Chennai and Bangalore.